Several times a year, Vistans hit the streets with the goal of keeping Vista litter-free. Since its inception in 2017, Only Losers Litter Trash Walks have had 331 participants for its eight community trash pick-up events. Now in its second year, has had four trash clean-up walks with 100 people taking part in the day. The next trash pickup is slated for May 20. 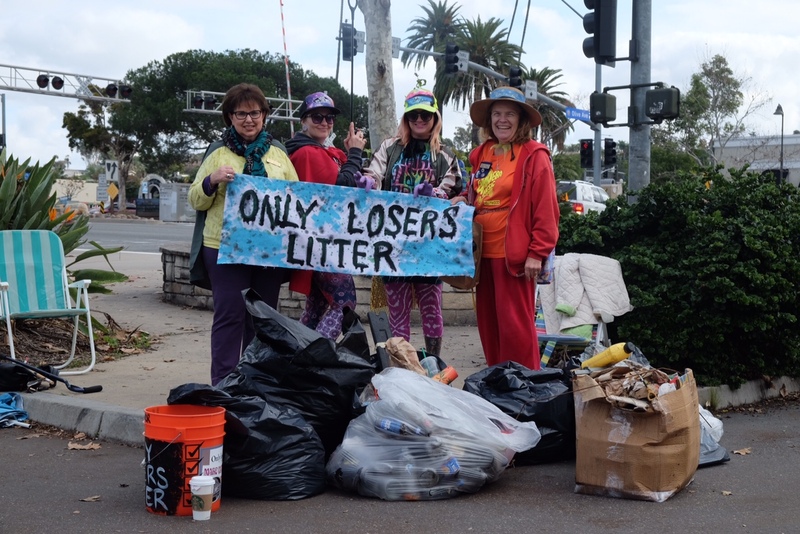 Only Losers Litter is a team effort championed by The Backfence Society and The Woman’s Club of Vista. The idea for Only Losers Litters came from Sarah Spinks, the president of the Backfence Society, who has lived in Vista her entire life. Spinks said when she was collecting trash for the October art installations event, she noticed all the garbage she gathered from her very short daily walk taking her son to school. On her trash walks, Spinks said she noticed the attention she would receive from drivers and other walkers. So, she decided to make the most of it by dressing more outlandishly. Spinks believed that making the trash pick-up a spectacle was a positive action that was in and of itself infectious to other Vistans who became eager to join. Nancy B. Jones, a longtime Vista resident and also the first vice president of The Woman’s Club of Vista GFWC, said the club donated to support the development of the Only Losers Litter Trash Walk website. Jones also helps coordinate the community trash events via email. Jones said the club continues to be a sponsor of the walks. Jones attended the first trash walk in 2017 and to date has participated in 10 of them. “Sarah is an amazing inspiration with her civic involvement on the Arts Commission and with the Backfence Society clubhouse promoting art events and meetings,” Jones said. Jones shared that on average, the community trash clean-up walks has 20 to 30 participants each time. The events last about an hour-and-a-half. Supplies such as gloves, pickers and trash bags are provided. “Only Losers Litter is all about citizens taking responsibility for cleaning up trash here in Vista,” Jones said. “Every month, we remove at least 10 bags of trash and recyclables from an area of our city. “We cover what no one else is taking care of like ordinary litter, discarded furniture and clothing and lots of cigarette butts and plastic water bottle caps,” she added. Participants have also been coined “the caped community crusaders.” People of all ages come pitch in — and they cover a lot of ground. According to Jones, the first trash walk was based at the NCTD Transit Center in January 2017. Since that time, these caped community crusaders have covered areas such as Shadowridge and North Santa Fe, East Vista Way and Hacienda Drive, downtown and Vista Village and Brengle Terrace Park and Buena Vista Park. “There’s trash everywhere, and we’re doing our best to reduce that blight on our environment,” Jones said. Spinks has a roster of people she’d like to thank for making the Only Losers Litter Trash Walks so successful. The list includes Pantazzo for sponsoring the program through the Woman’s Club of Vista, Jones for email event coordination, Panchevre for her leadership role, EDCO for its sponsored dumpsters, her family members and the volunteers who have helped make Vista cleaner. To learn more about the Only Losers Litter Trash Walk at 4 p.m. May 20 at the Food 4 Less parking lot on Hacienda Drive, visit OnlyLosersLitter.com.